One of the biggest sources of discouragement that plagues Christians today is that so many of us feel like orphans. It doesn’t seem to matter whether you have actual parents or not. Orphanhood is a state of the heart; a feeling… and it’s not something you can talk yourself out of if you’re already in that state. But an orphan heart is something for which we can receive healing. I know. I spent many years feeling unloved; feeling that I didn’t belong anywhere or to anybody. I felt like I had no home. I was an orphan. It wasn’t my parents’ fault; they loved me. Orphanhood was simply the state of my heart, because I had not received God’s love deep down in my innermost heart yet. So I felt like an orphan. And because I felt like an orphan–belonging nowhere and to no one–I was hounded by fear. I would have frequent panic attacks when there was nothing going on outwardly of which to be afraid. I could feel something constricting my chest. I would desperately gasp for breath. He showed me then that love is the antidote to fear. He is the only One who loves perfectly, so it is specifically His love that casts out fear. I began to meditate on God’s love (see the story in the link above) and, over time, God set me free from fear. He filled me with His perfect love and healed me completely. As I have continued to meditate on God’s love, He brought me into not only freedom from fear, but also into an understanding of how wildly He loves me. He has healed the orphan’s heart I carried, and has given me the secure heart of a beloved daughter. Note: My favorite resource ever about this subject is Healing the Orphan Spirit by Leif Hetland. Click here to check it out on Amazon for Kindle or paperback (affiliate link). God really advanced the healing of my heart when I read this book. Maybe you suffer from an orphan heart too. Maybe your heart longs to be healed. Maybe you long for a place to belong. Maybe you’ve been hounded by fear also. Maybe you feel empty and lonely, even when there are plenty of people around. Maybe you long to know and be known, to love and be loved. Maybe your heart’s desire is to have a Father and a home. If that’s you, my heart goes out to you. I know how you feel. God LOVES you. He’s a big Papa with a big heart, and that heart beats for you. If God had a nightstand, your photo would be on it. If God had some spray paint, He’d go to a wall and draw hearts all over it with “PAPA + YOUR NAME” written inside. If God had a wallet, your picture would be in it. If God had a mantel, your baby shoes would be bronzed and displayed on it. He keeps your love letters (your prayers) with Him in Heaven all the time. He’s spent so much time ruffling through your hair that He has counted every hair on your head. His heart is full of you. He is thinking of you always. Everytime He thinks of you–which is constantly–He’s overjoyed at your existence. You are His dream. You are His pride and joy. Your Papa God loves you. He knew you in Heaven before you were conceived on earth. At just the right time, He threw you on the womb of your mother. He knit you together in your mother’s womb and planned the exact moment of your birth. He has been loving you and watching over you all your life. He has never looked away, not even once. God’s heart beats for you. You don’t always have to have an orphan heart. You can feel like the beloved son or daughter you are. Your heart can be healed. “Papa God, I love You. I know You love me too, but I need Your help to feel like it. I need to “get it” down deep in my heart, deeper than I can go or reach. Imagine your Papa carving your name on His tree in Heaven. Imagine Him taking His wallet out and showing off your photo to Jesus in Heaven. Meditate on God’s love. See it in your mind’s eye. Ponder on it. And God will begin to heal your heart. Did this blog post encourage you? If so, I’d love to hear about it. Please leave a comment below. If this post would encourage others you know, please also consider sharing on Facebook, Pinterest, or Twitter. Thanks! This was wonderful!! I am reminded of 2 Cor 1:3-7. If you had not gone through what you did, you would not be able to comfort others in the way you have with this post. This ministered to me greatly. I believe this is a huge problem today. More people are alone and lonely than ever before. We have amazing technology with the internet, emails, and iphones but while that has been a fabulous invention, people have come to rely on it as their primary source of communication (texting/emailng, etc) in place of visiting or calling. It has sadly served to alienate us even more from one another. I experienced this while living in Africa for several years where we were forced to depend on one another to survive. When I returned to America, I experienced terrible loneliness because Americans have forgotten to be interdependent on one another–an important piece that God uses to show us His love. THANK YOU for this post. Bless you!! Amen! Thank you so much, Jan. It’s so true. We need one another! I agree wholeheartedly!!! Oh God, I know I have an orphan heart. Like you wrote, this is not something we can fix or heal ourselves. Please pray that I can know and believe in the Fathers love. I weep for this, it is my greatest need and desire. Hi Brenda, precious sister, thank you for reading. I can feel your pain through your comment. My heart goes out to you. Please, please, please get Leif Hetland’s book that I linked to above-“Healing the Orphan Spirit.” Papa will use it to bring you healing as you read. And I will pray for you. Love in Christ, Jamie. Wow, Angela. Words are insufficient to respond to that. I’m so sorry that you had to endure that. My heart goes out to you! I am thankful to our Papa for touching you and beginning to heal your heart. I pray He would continue to overwhelm you with His perfect love so that your heart may be completely healed and restored better than it ever was before. Thank you so much for reading and sharing your story! May God bless you exceedingly as you continue to seek Him! 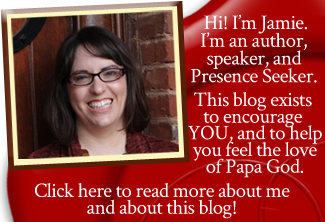 Hi Jamie,I stumbled upon your blog today and my oh my,am I blessed or AM I BLESSED? ?I feel overwhelmed,I want to read all your articles and memorize everything;I just want to soak it all in.My goodness. This particular article speaks to me so personally because I have struggled for a long time to really identify with God’s love for me,and even more so after my dad passed on. When I think of the illustrations you have included on the article, I feel warmth all around me. I thank God for directing me to your blog. I am blessed. Be blessed exceedingly and abundantly above all that we can ever ask or imagine. I will read this everyday until I am fully saturated in Papa’s love for me. Eva, I’m so glad our Daddy touched you. I pray He would heal your hurting heart, and I’m sorry for the loss of your dad. I pray the Holy Spirit would fill you in every place inside you that needs her Daddy, right now in Jesus’ name, and that He would protect you, nurture you, and grow you and build your life more than any human father ever could. In Jesus’ name. 🙂 Thank you so much for reading, and thank you for sharing! I’ve had a stressful day….feeling the aloneness of my life and knowing the things I read are a mirror of who I am…so much sadness and disappointments have weighed down my heart and spirit….I’ve struggled all year with this..then in october I almost ended my life…the agony in my heart was killing me…I ended up in the psych ward for 6 days and on new depression medication..which btw I’ve been on since 1996…I’ve suffered with bouts of depression most of my life…my father abandoned me when I was 4 or 5…I’ve agonized over this my whole life and even though I had a mother I lived an abusive and loveless existence…I suffer with deteriorated disks, both knees are blown out, diabetic neuropathy feet,and I’m supposed to “do mighty exploits and have some kind of healing and miracle ministry”….prophets have said…I’m nowhere and in no shape to do anything…somebodies made a huge mistake thinking these things…if you saw my life you would have to agree….but I love the Lord..and He has helped me endure….I’m still here. Funny I woke up w that feeling this morning not of love but fear. I think this is much bigger than just me and He’s showing me, training me. Part of me wants to say forget about it but I know that IS NOT THE TRUTH. I’m a feeler and I felt like He told me not too long ago how important it is for me to be ME…not a copycat of anyone else. I’ve felt waves of His presence and power today and have been able to intercede and that’s what I believe I am here for. I’ve had such a overwhelming love for people…and have perceived being hurt by other soulish people… (it’s very simple hurting people hurt people) helps me walk in grace. God says stand. and He told me specifically to pray for 30 days for said person to release that cuz I keep using that example in fear of being deeply wounded again by a closer “relative”. The former was a neighbor who praise God is doing really well and my heart has been released but the key to letting it go is prayer. Need to amend my Above post because this morning God dared me to never speak of pain again…kinda fell quick lol. He is so so good. This was extremely painful for me! I never realized until this morning reading this blog that I just kind of glance of God’s love for me and that I don’t really apply it to my life. It is nice to read about God’s love. But today for some reason as I read the words of God’s love and how he knit me in my mothers womb an emotion came to me of Why? If he knew me before I was born why did he let me be born to a mother who couldn’t love me and a father who would abandon me and never know me. Why did he watch as I was abused if he was there with me. I understand choices I made as a result were mine and mine alone but how…..that is where I stop. I can’t go beyond. I don’t even know how to deal with these feelings.